The list of Perth accommodation options is neverending and caters to everybody’s needs. From fun backpackers hostels to luxury 5-star hotels, there is plenty of outstanding offers for everyone. Of all the accommodation types in Perth, the segment of mid-range hotels in Perth is the most popular among travellers and has the biggest amount of options. To make it easier for you to choose the hotel when visiting Perth, we have compiled a list of the the best mid-range hotels in Perth. Based on the most important criteria like location, facilities and services, here is the mid-rang accommodation options we recommend. Situated in the heart of Perth, Peppers Kings Square Hotel is only a 4-minute walk from Perth Arena. From this hotel, you can easily reach all the major attractions and shopping spots in Perth. If you are eager to taste some modern Australian cuisine, no need to leave the hotel – just go to the on-site restaurant, Stage. 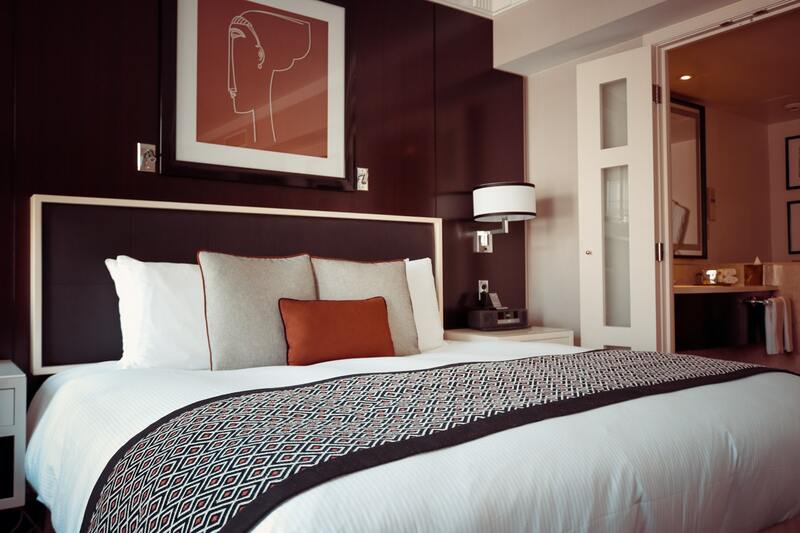 The rooms feature stylish contemporary design and high-end finishing. For those who love city views, don’t forget to request it when booking a room, you will be amazed by Perth city at night! Free WiFi and a valet parking service are also available for the guests’ convenience. Having a great central location, Holiday Inn is close to the main spots to eat, drink and shop in Perth. Not only this is important, but also the fact that the hotel is located accross the free bus stop and one block away from the train station. So if you plan travelling anywhere out of the city centre, Holiday Inn is a great choice location-wise. The airport is 12 km away and is easy to access. The concentration of cultural and business life in Perth, Perth Arena and Perth Convention Centre are only a 10-minute walk away. You can never go wrong with Holiday Inn! Attika, a small boutique-like hotel, offers self-contained modern apartments in a great location. In each unit, there are a fully equipped kitchen, air-conditioning and a secure safe. The hotel is situated in Northbridge, the heart of entertainment in Perth. There is a range of world-class restaurants, hidden bars, beautiful parklands and shopping spots in the area. All the key landmarks are close by. When you are not exploring the city, just enjoy your time in a cosy and homely atmosphere! Quest West Perth is an aparthotel that offers stylish and functional studios, located just opposite beautiful Kings Park. Perth Convention & Exhibition Centre and the heart of Perth CBD are only a 5-minute drive away. In this area you can choose between shopping at Hay Street Mall, dining at one of the premium restaurants, or spending your day at the park with family or friends. Besides flat-screen TV, a washing machine, an en suite bathroom with a shower, the rooms feature a fully equipped kitchenette. Some of the studios have a provate balcony. Did not have time to pick up some local produce to cook at the apartment? No worries, the hotel has got you covered and can provide grocery delivery services. Located just opposite Perth Arena, Four Points by Sheraton Perth offers luxury accommodation for reasonable prices. This hotel provides all the facilities neded for a great stay, including a restaurant with a bar, a fitness centre, and a 24-hour business centre with conference and meeting rooms. Within a 5-minute reach by car, you can find Kings Park and Botanical Garden, and enjoy breathtaking views of the Perth cityscape. To go on a little adventure, head to Northbridge, which is only minutes away. There you can find a number of great restaurants, fascinating bars and hit the dance floor in one of the best Perth nightclubs. Located in one of the most vibrant neighbourhoods, Perth CBD, Alex Hotel is among the best mid-range hotels in Perth. The feature that makes this hotel so special is the rooftop terrace, from where you can enjoy amazing city views. One of the main shopping areas, Hay Street, is a 10-minute walk away, while Kings Park and Botanic Garden are a 10-minute drive away. Guests enjoy the convenience of free bicyles to roam around the city and see major attractions. The rooms are extremely comfortable, quiet and cosy. Some of the rooms also have balconies. Rooftop terrace, free bicycles, private balconies, contemporary decor…Not only luxury hotels in Perth can provide these perks. Why spend thousands on accommodation if there are hundreds of mid-range hotels in Perth that offer fantastic accommodation for a good value?